-Robert Paul Wilson, grandson of one of the surviving MMM children, cited in Novak, xiv. Shannon A. Novak. House of Mourning: A Biocultural History of the Mountain Meadows Massacre. Salt Lake City, Utah: University of Utah Press, 2008. xvii + 226 pp. $29.95. Hardback, ISBN: 978-0-87480-919-0. 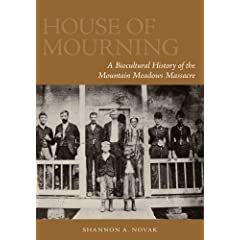 This latest addition to the historiography of the Mountain Meadows Massacre, House of Mouring: A Biocultural History of the Mountain Meadows Massacre by Shannon A. Novak , has been almost a decade in the making. On August 6, 1999, Utah state archaeologist Kevin Jones called Novak to solicit her aid in analyzing some remains that had been unearthed in southern Utah. Three days before, during renovation work in preparation for a new monument/memorial at Mountain Meadows, a backhoe had uncovered a mass grave, exposing thousands of bones (7). At the time, Novak was unfamiliar with the events surrounding Mountain Meadows and the controversies that still linger there, “I thought I had left ‘dead-body politics’ behind” (xiii). In all, the remains of about 28 bodies were recovered (roughly 1/4 of all victims) and 18 skulls reconstructed from the thousands of bones and bone fragments recovered (59, 10). The bones were washed and sorted at the Museum of Peoples and Cultures at BYU (with student assistance) and then transferred to the University of Utah. Legal complications and outside pressures forced a sudden halt to the project and the remains were turned over to BYU for reburial the day before the September 11 dedication of the newly constructed memorial, just about a month after their exhumation (7). Novak aims to “situate the massacre in a wider historical context and approach it not as a morality tale but as a busy intersection of social and cultural forces in antebellum America” (4), and succeeds in doing so. In launching her study, Novak acknowledges past scholarship on the Massacre, but does not comment on it in too much depth. She argues that even the best works on the subject (which she considers to be Bagley and Bigler) do not say enough about the victims, but focus on the perpetrators. She lightly takes to task other authors (Brooks, Alexander, Arrington & Bitton) for making only cursory examination of the victims’ and their background. At worse (according to Novak) one Mormon text (Whitney’s History of Utah) claims that the Mormons were also victims on the killing fields. Novak’s evaluation of the historiography focuses on how the victims have been treated and she does not comment on the conclusions or methods of each text. She puts these works into somewhat broad categories, apologetic (Brooks, Alexander, Arrington & Bitton), hostile/radical (The Tanners and others), Popular (Denton, Krakauer, McMurtry), and the best treatments (Bagley and Bigler). Though I would have to agree that Bagley’s book does do a better job in treating the lives and travels of the victims than any other past treatment, I would take issue with Novak’s characterization of Brooks’ book as “apologetic” as well as the need to mention the Tanners at all. All said, out of these past works, Novak quotes Bagley most frequently, especially in her second chapter, and does quote Brooks on a number of occasions. After some preliminary notes on historical perspectives on the massacre, Novak’s first chapter, “Streams”, examines the geographic characteristics of the Ozark Plateau, spanning northern Arkansas and Missouri from whence the emigrants came. Novak explores how geography of the Plateau affected the lives of its early settlers, touching on race, class, social, and economic issues and gives context to the lives of the families that would go on to Mountain Meadows. The Second chapter, “Confluence”, reports that the group that was killed at Mountain Meadows did not set out from Arkansas as a cohesive group, but was the result of a number of additions and divisions and examines some factors that may have led these groups to converge at Mountain Meadows. Chapter three, “Nourishment”, discusses the dietary habits of the Ozark Plateau as well as on emigrant trails and how expected norms match up with the evidence found in the bones. Using detailed 1850s US census data, Novak outlines the property, agricultural, and livestock holdings of the 13 major families whose members made up the bulk of those killed at the Meadows. Novak identifies evidence of anemic lesions in some of the remains that indicate active cases of anemia at the time of death and how diet may have contributed to these conditions. Additionally, Novak examines the teeth recovered and shows that the incidence of caries (cavities) and overall dental health was about average for the time. Tobacco use is examined as well with 16 percent of adult teeth exhibiting tobacco resin stains. In chapter four, “Constitution”, Novak examines claims by John D. Lee and others that the emigrants were “diseased” with pox or syphilis and Dame’s charge that “all the women were prostitutes”. To do so, Novak discusses disease patterns and attitudes toward disease in antebellum culture. The skeletal record, she reports, shows no evidence of pulmonary disease (like tuberculosis) or of syphilis. (Novak concludes that the physical constitution of the emigrants was actually quite good). Novak offers that such a diagnosis by Lee and others could only be arrived at through a close examination of the affected anatomies. Another possibility advanced is that these charges were more rhetorical in nature, since cultural attitudes about disease tied affliction very closely to morality. “To insinuate that parents were afflicted with disease–especially one such as syphilis–was to comment on the character, or future character, of their offspring” (109). In the fifth chapter, “Domains”, Novak explores gender norms in the Ozark region and analyzes what the bones have to reveal about differences in activity and injury patterns between the men and women. The samples at Mountain Meadows show that the femora (upper leg bones) of the males indicated reduced mobility while the femora of the women were elongated, suggesting an increased amount of mobility. Novak concludes that this pattern is consistent with the expected result, with women walking the Ozark hills and men riding horses. The final chapter, “Epitaph”, is perhaps the most striking. Here Novak analyzes the injury patterns that caused the death of the victims. First, Novak discusses attitudes towards death on the trail (In Jack Baker’s last will and testament, dictated in April of 1857, his first concern was to secure a decent burial). “Like many emigrants, Baker dreaded the thought of his bones left unburied and exposed to the sun, the wind, and the wolves” (149). Providing photographs of bullet wounds, massive skull fractures, and bones with animal teeth marks, Novak walks the reader through the different ways the individuals in question were killed. The injury pattern is consistent with historical records, the men having been shot, the women and children bludgeoned. The exception being that no evidence corroborates reported injury by scalping, throat cutting, or arrow wounds. The most common trauma was a single gunshot to the head, point blank, execution style. The shattered condition of many of the teeth indicate that a number of the victims were shot from behind with the bullet exiting the face. Finally, Novak shows how even the remains that are absent exhibit loss consistent with scavenger activity, and how those remains that are present exhibit damage consistent with weathering incident to lengthy exposure to the elements. This study is a powerful example of how interdisciplinary work can enhance and expand historical analysis. By introducing elements of anthropology, geography, sociology, and medicine, Novak confirms some elements of the historical narrative concerning the Mountain Meadows Massacre while refuting others. Additionally, it is the most in-depth treatment of the lives and times of the victims of Mountain Meadows. Novak admits that this evidence cannot shed light on motives or responsibility of the assailants, and does not attempt to address those issues. All told, Shannon Novak’s House of Mourning will prove to be a valuable addition to the study of the tragic tale of the Mountain Meadows Massacre. Shannon A. Novak is a forensic anthropologist with a doctorate from the University of Utah and currently an assistant professor of anthropology at Syracuse. Thanks for this review, Jared. I’ve only heard good things about Novak as a scholar, and your summary indicates that this is a solid work that is sheds a lot of light on the massacre as an event in American cultural history. This is like CSI meets the History Channel. Excellent review. Question: speaking of the historical narrative, does Novak spend much time addressing previous scholarship on the massacre (Brooks, Bagley, etc.)? Thanks for the thorough review, Jared. I second David’s remarks about this being a fine contribution in examining MMM as an event in American cultural history. Good question, Justin…I have added a paragraph about that. I’m away from the book, so I had to do it from memory. I may have left some texts out, but I believe the summary to be correct. #1, Yea, I was thinking “Bones”, but I like CSI & History Channel. Novak’s forthcoming work on the Donner party promises to be a treat as well. Thank you for the review, Jared. She argues that even the best works on the subject (which she considers to be Bagley and Bigler) do not say enough about the victims, but focus on the perpetrators. I wonder if she considers them to be the best treatments solely based on the criterion of their examination of the victims or if she thinks that they are the best overall. I agree that the Donner Party book looks fascinating. #6, I get the feel that it’s based on examination of victims as she really doesn’t talk about too much else, at least not that I can remember. She does mention that too often treatments of the massacre tend to attempt to make morality judgments about the present based on the past. I feel that may have been just as much a nod to Bagley as it would be to anyone else, but that’s just my guess. Wasn’t there a bloggernacle post a while back on attitudes toward death and burial in early 1800s America and how the Civil War impacted those views and all that? I don’t know if there was a post but the civil war sure changed funerary arrangements at a minimum. I was a reader for “House of Mourning”: in my comments, I suppose I didn’t stress that this passage was unfair. Chapter 4 of _Blood of the Prophets_, ?The Arkansas Travelers,? contains almost 7,000 words on the members of the party–all of it original research never used in any previous book on the awful tale–and following chapters contain a wealth of new information about the Fancher train. This is not to take anything away from Dr. Novak’s monumental work, which is brilliant. Wait till you see the hatchet job Ron Walker does on the Arkansans. And you thought the original story was disgusting…. I have read the Turley-Walker-Leonard manuscript. There is no hatchet job, and in some ways their treatment of the Arkansans is more sympathetic than Bagley’s. Certainly it is less syrupy — anybody else remember Bagley’s description of the Arkansans’ camp, with the beautiful American mothers bending gracefully over their cookfires, dabbing delicately at their glowing brows, their benevolent smiles on the fair lads and lassies who frolicked merrily among the wagons under the watchful care of their stacked and packed American fathers? Puh-leeze. That scene was so overdrawn and tender that it would have gagged Norman Rockwell. Jared, I am pleased to have stumbled onto this wesite. I am interested in understanding better the relationship of the overall Utah War and the MMM.